It's a new month, which means it's time for a new remix series! Because October is one of my favorite months and because I just love fall style, I'm featuring one of my favorite fall staples - the chambray shirt. Beyond just being a top fall staple, I consider a chambray shirt to be a year-round wardrobe staple. This shirt is legitimately one of the most versatile clothing items I own (second only to dark skinny jeans...seriously). This month I'll be showing 3 different ways to style a chambray shirt in the fall, and then at the end of the month I may also do a post showing all of the different ways I've ever styled this shirt. I noticed I'm not my smiliest (just made that up) in these photos, and I can explain! I've been quite sick this week with an upper respiratory infection (no bueno), so I've been working from home the last couple of days and looking very unglamorous in giant college t-shirts. However, I toughed out some outfit photos yesterday evening...hence my barely smiling, pale face haha. Fabulous. PS ~ congrats to the winners of the Stella & Dot giveaway, Sarah Peterson and Lola Vine! Love the denim on denim, so cute!!! So cute and casual–love this! I'm wearing those Target flats today...they're the best. Cute look! It won't be much longer that we can get away with shorts here in Missouri and I'm soaking up every last minute of it! 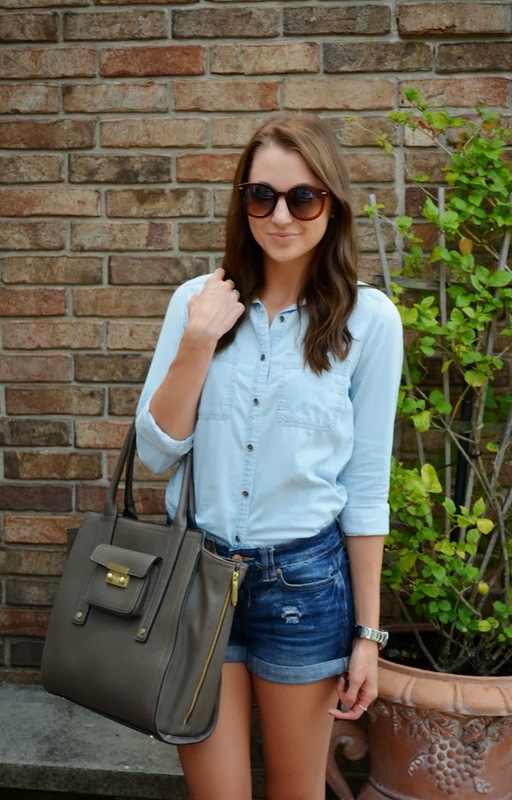 Hi Jacy, excited about this one, i think we all have a chambray shirt somewhere in our closets so I am really interested in seeing your different stylings, this was an excellent one to start with. Always glad to see you stop by...Happy End Of The Week! Looking forward to your looks! Chambray is definitely a staple in my wardrobe as well.